This is a sad time for those of us concerned about public education. 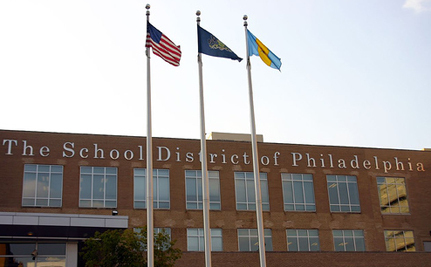 Schools are closing across the nation, class sizes are increasing as more and more teachers get laid off, budgets are being slashed, and now the Philadelphia School District has announced its possible dissolution. Pennsylvania’s largest school district has recently been dealing with huge deficits and declining enrollment. Now it is facing a possible $218 million shortfall for the upcoming 2012-13 school year that, if left unaddressed, could grow to a $1.1 billion over the next five years. So some radical change is needed. “A Blueprint for Transforming Philadelphia Public Schools,” released on April 24, is a sweeping reorganization proposal that includes more than half a billion dollars in budget cuts by 2017. Under the five year plan, 40 underutilized or under-performing schools would be closed next year. Six more schools would be closed each year after that until 2017, bringing the total number of closed schools to 64. The plan would also divvy up those schools that remain among “achievement networks” led by teams of educators or nonprofit institutions. These achievement networks would have 20 to 30 schools each and be connected by either geography or a common, creative approach to teaching and learning. The leaders of the network, which could include successful principals, would have contracts based on performance and be required to serve students of all abilities and situations equitably, reports thenotebook.org. In a further cost-cutting measure, decentralization would also result in the staff at school headquarters to be reduced from 600 to 250. Operating expenses would be cut by $122 million. $156 million would be cut in wages and benefits. There would also be a 7% reduction per child in charter schools which would be frozen at that number for three years. Where did the plan come from? It turns out that the William Penn Foundation paid $1.5 million tab for the five-week contract for an outside management consultant, the Boston Consulting Group, to help the School Reform Council and District leadership come up with a plan. Really? $1.5 million for five weeks? Couldn’t that money have been better spent? As a teacher, I have to ask: why not go to the teachers and the students for input? Why does education keep turning away from the experts in search of answers? I am not personally familiar with the Philadelphia school system, but I do know that the habit of turning to outside business leaders for education is becoming depressingly familiar. Chief Recovery Officer Thomas Knudsen says the plan is designed to ensure the struggling district has safe, high-quality schools and is financially stable. Knudsen says closing buildings and streamlining the central office will make the district more efficient. The proposal still must be approved by the School Reform Commission. Several public hearings will take place beginning in May. This is obviously an extremely complicated situation, which merits a great deal of careful thought. How are people reacting to the proposal? This restructuring plan has nothing to do with raising student achievement. The district provided a business model, not a research-based plan for turning around or supporting schools. By closing 64 schools and transferring more and more children out of publicly accountable, neighborhood schools and into charter, cyber-charter and private schools, the School District of Philadelphia is saying it is no longer wants to be in the business of educating children. It would rather manage a ‘portfolio’ than do the hard work my members do every day educating children. This is a cynical, right-wing and market-driven plan to privatize public education, to force thousands of economically disadvantaged families to select from an under-funded hodge-podge of EMO- and charter-company-run schools and to convert thousands of professional and family-sustaining positions into low-paying, high-turnover jobs. I find it ironic that the district chose Election Day to announce it is dismantling our public school system, which is the foundation of our democracy. Every person who cares about democracy and about educating economically disadvantaged children, children of color, immigrant children and children with special needs should stand up to the SRC and tell them our children and our schools aren’t for sale. Everyone will have a chance to weigh in beginning next Tuesday, May 1, when there will be the first in a series of ublic hearings on the proposal. Stay tuned for more developments. I don't know about Philly, but here we have a lot of vouchers. So the kids I teach say "next year I'm going to Voucher School Academy! I won't have to go to public school!" Great. So next September the kid and the chunk of voucher money are taken out of the public school. In about a month either the kid is acting out to turn "I can't" into "I won't" because he's behind academically compared to private school kids, or his mama has realized the private school doesn't have special ed teachers and isn't equipped to serve his special needs, and he's back to the public school. But the FUNDS to teach him stay at the private school even though he's no longer there. If you're not a part of the solution, there's good money to be made in prolonging the problem." Sounds like that's exactly what happened in Philly. Why didn't they go to the teachers and the people who are intimately involved with the schools operation instead of blowing 1.5 million on an outside consultant? Privatization will not save money, or provide for better education. They are crazy if they believe otherwise. Control the children and you control the adults. When the Nazis took over in 1933 they began destroying all other political parties. This reduced the voice of the people in government. Not only did the Nazis go after political groups they also went after unions, trade organization, churches and other organized groups that could have formed a nucleus of resistance to the Nazi party and their ideals. One of the most effective forms of control over people is to control their children. After 1933 most Germany children joined the Hitler youth. Ten year boys joined and quickly were turned into the eyes and ears to spy on families. Parents became fearful of their own children. Teachers who would not teach Nazi material were replaced so even children not in the Hitler youth received Nazi training at school. When you control children you control the parents. Movies became pro Germany and even pro expansion. Radio programs followed the party line. The arts were forced to follow support the party line. Welcome to America: Home of the uneducated because we rather give money to the rich, and blow up other countries instead of take care of our own people. Paul, I first read about these camps back in 2007. I have my doubts about anything coming out of Jesse Ventura these days. And Judy - you don't have a clue what you're talking about. You're just ranting. Go to Congress to address those concerns. They control how much the states get to spend on education, not the President. And blame the oil and gas companies for making the prez go overseas. They refused to allow the technologies to be subsidized here. They will only invest .015% in these industries. They don't care about you, only themselves. Tax Payer money being spent elsewhere and not in America. School children and their families are suffering for his policies. Even though there are 13 million unemployed Americans, the Obama administration is working to create "green jobs" in foreign countries! Over three years ago, President Obama ratcheted up government spending and debt with his $831 billion stimulus package, while promising to create jobs and boost economic growth here in America. Wasteful spending on green jobs that only benefited obama's big donators to his campaign funds. Charity begins at home, it is important we have well educated children for the future of America.